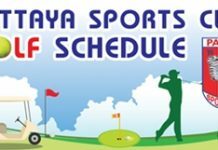 Top-ranked Yani Tseng shot a 6-under-par 66 last Sunday to win the season-opening Honda LPGA Thailand by five shots over Michelle Wie at Pattaya’s Siam Country Club. The 22-year-old began her 2011 season with victories on the Ladies European Tour at the Australian Open and Australian Ladies Masters in consecutive weeks prior to last week’s LPGA season opener. 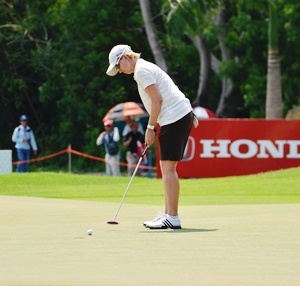 She has now teed it up four times in 2011, including a small professional event in Taiwan, with four victories. 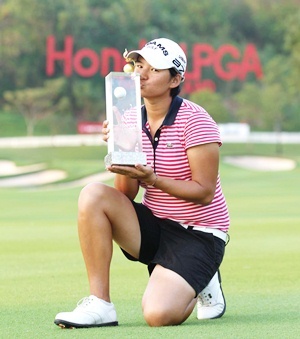 Yani Tseng of Taiwan holds up the 2011 Honda LPGA Thailand champion’s trophy after shooting a final round 66 to win the tournament by 5 shots on Sunday, Feb. 20. Tseng led by one stroke over Wie and I.K. Kim of South Korea going into the final round at the immaculate Siam Country Club Old Course and had the lowest score of the day with six birdies in her first 13 holes before her first-and-only blemish of the day at 14, where she made bogey. She rebounded with a birdie at 15 and never looked back, claiming her sixth-career LPGA Tour victory at 15-under-par 273. Wie had to settle for a 70 to finish second, while Kim was another shot back in a tie for third with Karrie Webb. First round leader Kim birdied three of her first six holes to sit tied for the lead with Tseng, and was at 13 under after a birdie on the 13th. However, she made a quintuple bogey on the 17th including five chips from the back of the green to fall out of contention, before finishing with a birdie on the last to secure a tie for third. Wie also put pressure on Tseng by chipping in for a birdie on the first hole and picking up two more shots on the sixth and seventh. But she didn’t make another birdie the rest of the way and was already four shots behind Tseng when she bogeyed the 17th. Carrie Webb bogeyed four of her first five holes in the final round but bounced back on the inward nine holes to finish with a 69, while Paula Creamer of the United States shot a 71 to finish in fifth on 8-under. 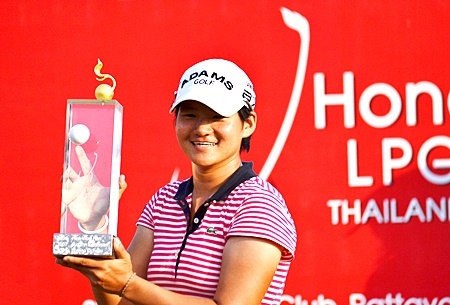 Tseng will have a chance for a fourth straight victory at this week’s tournament in Singapore. With the win, Tseng earns $217,500 and an early lead on the LPGA Official Money List and Rolex Player of the Year race. Paula Creamer hits her tee shot on the 16th hole. Carrie Webb putts for birdie on the short par-three 8th. Tseng strikes an iron into the green during her final round. Michelle Wie celebrates after birdying the first hole. I.K. 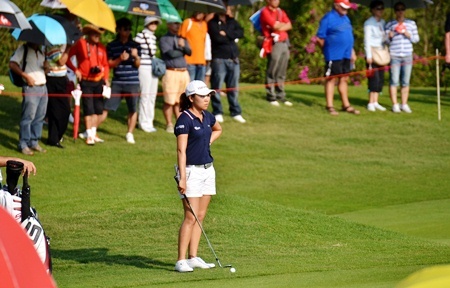 Kim of South Korea faces a meltdown on the 17th hole where she made a quintuple bogey 9 to fall out of contention. Yani Tseng poses for the assembled media holding the champion’s trophy. The Honda girls always add some colour to the event. 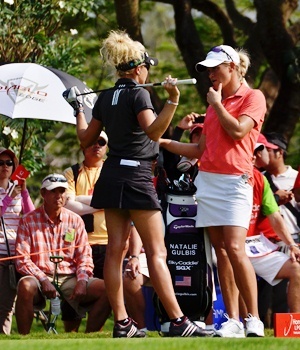 The colorful Natalie Gulbis, left, and the 2007 Honda LPGA Thailand champion, Suzann Petterson, right, wait to tee-off on the final hole. 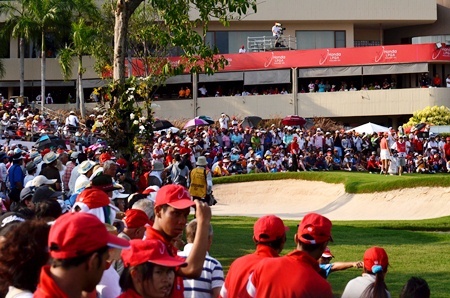 Huge crowds gather around the 18th green as the final pairing prepare to putt out.